Isohyet maps show the different in precipitation over a certain land area. In this map, an area is shown depicting its different rainfalls. The differences in rainfall across the area can be shown by the different colors. 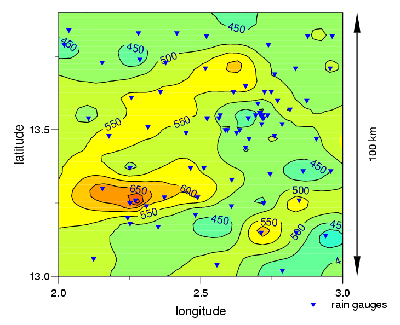 The red area shows when the rainfall has is the greatest, which only represents a small area. The orange shows the next highest rainfall. The light green shows when rainfall is at its lowest; this is seen in a greater area than the red or orange. Isohyet maps only show the precipitation values.